These Hidden Gems In Goa Will Make Your Long Weekend Epic! You really think you’ve seen it and done it all in Goa? Surprise surprise, you’re not even close. Here’s a list of 5 things that you didn’t know existed, and could make your trip a memorable one. It’s pouring beer in Goa. We are not just talking about pints here. Goa just opened up their second brewery and it’s already a hit. Goa Brewing Company (GBC) in Sangolda, is only a few months old but their specialty ‘Eight Finger Eddie’ is already at star at the state's best bars like When we say bars, we're talking the likes of Joseph's, Bomras, Cavala, Vaayu Village, Gunpowder, Villa Blanche, Zeebop, Baba Au Rhum, That Crazy Hostel and supermarkets like Delfino's. We’ve heard that they're running currently running trials on a cherry flavoured stout and a doughnut flavoured beer! Ditch the crowd and vacay at this gorgeous property - Fairfield by Marriott Goa Anjuna, located snuggly in the middle of Anjuna and Baga. And it's situated amidst the hub of the city. So if you feel like scurrying off to the beach at any given point or want to go off to any of the popular cafes and bars, it's all close-by. Or if you're feeling too lazy to go out, they’ve got a swimming pool with a serene atmosphere perfect for an evening of cocktails and snacks or a relaxing swim. This property also has a private gym and spa, and balconies attached to each room along with a great staff to help you enjoy your holiday to the fullest. Plus, if you book a room online, you can also book your breakfast for only INR 1* (T&C apply). Goa might be every college goer’s go-to getaway for it’s the party hub, but that’s all it’s about. 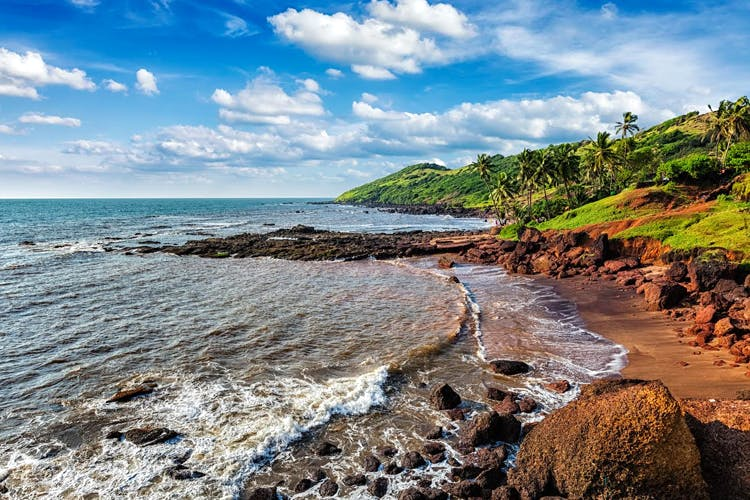 If you’ve got an adventurous streak and crave a water experience that’s more intimate and not interrupted by a million tourists clicking selfies or women offering to braid your hair, then hit up Konkan Explorers for a memorable boat cruise. They’ve designed packages to include 1–4 hour-long trips into the Chapora river. They come with the offer a memorable boat cruise (with beer and poi burgers, of course) along with kayaking or sailing opportunities. Cirrus At Anjuna is a free-for-all arts and music space that’s as abstract as it gets. Ignatius (aka DJ Iggy) manages to combine activities with a residential format that’s pretty chill. You’ll find tree houses, a skate park, a pool, a terrace café, a vinyl ambulance, upcycled cottages and events that span across shopping and underground music gigs and arts meet. Just play your part and don’t take up anybody’s else’s space, and you’ll fit right in and feel like a part of the family. We’ve all been to the Wednesday flea markets at Anjuna, or the bhaiyas with stalls lined up next to the beaches filled up all sorts of pretty knick-knacks. But if you’re looking for something more personal, then look up Nonsense Curry By Jolynn Carniero. This is two-year-old independent brand that creates and curates a range of lifestyle products (neckpieces, lamps, pillows, badges and notebooks) with prices starting at as low as INR 80! She curates everything from scratch and manages to pin down what exactly the customer wants. So if you’re looking to take back something awesome for someone just as awesome, this is where you’ll get it.